wearing: Jumper and shorts from Missguided, Heels form Rubi (on sale here!) and beaded bag from Sussan. I am so happy to be on uni break right now! It's like a preview of summer and I can't wait to be hanging at the beach every second day and wearing next to nothing for months! Something I really wanted was black shorts for summer and these are an exciting solution. When wearing I repeat the mantra 'I must not run my hands across studs' because it may be fun but to a stranger I seem to be getting a bit too familiar with my shorts. I now have my iPhone 5 safe and sound and currently making the transition from my old 3G baby. Exciting! p.s. don't forget my giveaway on Facebook HERE! Absolutely love your pictures! what type of camera do you use? Nice choice! I was going to pick this jumper too :) but ended up with some else :) I look great! AWWW i love your blog! thanks for comment mine <3<3<3<3 follow back hun? So in love with that sweater! Super cute look. wow, how amazing you are! in love! Wow! Awesome outfit! I love these shoes! That shorts is so cute! And heels as well! Love those shorts and bag :D! Looks like nice weather where you are! Melbourne summer needs to hurry up! 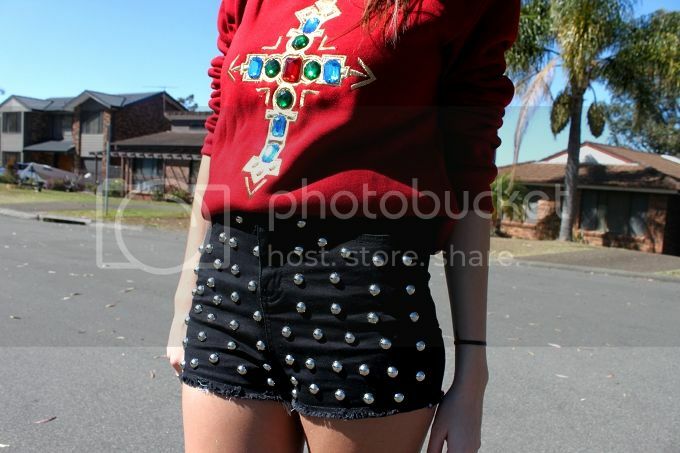 Those studded shorts are a dream! So purdy with the bejeweled sweater! love love love your shorts and your shoes!amazing blog! what do you think about follow each other? i like your blog!! Great outfit! I love that sweater! Such a cute outfit dear! Love your style! Those shorts are adorable! I love the embellishments. I can't stop looking at your pics, so good and you are so beautiful! this is totally everything I like !